This article will provide a basic review of what organic materials are, what is known and unknown about them in the oceans, how these organics may be different in reef aquaria, and a summary of some of the effects, both positive and negative, that organics may have in such aquaria. Organic compounds are defined by chemists as those that contain carbon and hydrogen atoms. They can contain other atoms as well, but must contain both carbon and hydrogen. A few exceptions to this naming convention are worth pointing out. Carbonic acid (the combination of carbon dioxide (CO2) and water (H2O), H2CO3) and bicarbonate ion (HCO3-) are the two primary exceptions that aquarists encounter. The name "organic" stems from the belief derived centuries ago that such compounds could be made only by living organisms. The name has stuck, despite this belief being disproved as early as 1828, when a chemist synthesized urea (a primary component of urine: NH2CONH2) out of two inorganic compounds: potassium cyanate (KOCN) and ammonium chloride (NH4Cl). It should also be made perfectly clear that the chemical definition of "organic" has absolutely nothing to do with the marketing and regulatory way that the term organic is used in many countries to apply to certain methods of farming or food processing. All living organisms are composed of organic materials to a great extent. Other organic materials include sugars, starches, proteins, DNA, fats, gasoline, natural gas, alcohol, automobile tires, Corian countertops©,2 super glue, computer keyboards, and acrylic aquaria. Oceanographers often classify organic materials as being either dissolved organic matter (DOM) or particulate organic matter (POM). The definition is operational, with DOM being defined as all organic materials that can pass through 0.2 - 1.0 mm filters, and POM being all materials that are retained by such filters. While this definition is useful and easy to interpret, it can be somewhat misleading. A chemist asked about a 0.2 mm droplet of oil in water would not claim that it was "dissolved" in the water, yet it would fall into the definition of DOM. In a reef aquarium, the things described as POM would include living organisms, such as some bacteria and phytoplankton (and all of the "dissolved" organic materials inside of their bodies). It would also include what aquarists frequently refer to as detritus: the accumulated particulate organic material that arises from parts of dead organisms and the clumping of dissolved organic materials. The nature of the organic matter in the ocean is poorly understood. Part of the reason for this lack of understanding stems from the tremendous variety of organic material that exists. There is essentially no limit to the number of different organic compounds that are theoretically possible, and the fact is that many millions of organic compounds have been synthesized or identified. Identifying and quantifying every possible organic material in seawater is just not possible, at least with present day technology. Consequently, identifying the form organic materials take in the ocean most often involves grouping them into classes by a functional test, such as whether they can be extracted from the water with a hydrophobic solvent, whether they contain nitrogen or phosphorus, etc. With each turn of this cycle, some of these organic materials become more and more refractory. That is, they become less and less palatable to organisms, and are turned over more and more slowly. Eventually, some remain that are largely resistant to further biodegradation and processing, and these can then stay as DOM for many thousands of years. Essentially, they are the waste that is left after every organism has had its shot at using them. The pathways for degradation of such refractory molecules are not well known, but likely reflect some rare biological events (rare bacteria encounter them, they encounter a rare enzyme, or they are acted upon by an enzyme that does not normally process them, etc.). The long term degradation likely also includes physical and chemical processes, such as oxidation by oxygen, ozone, or other oxidizing agents, and being hit by appropriate radiation (UV, x-rays, gamma rays, etc.). Dissolved organic material in the oceans is often measured in terms of its carbon content, and is referred to as dissolved organic carbon (DOC) and particulate organic carbon (POC). Surface ocean water typically has about 60-90 mM DOC. That range corresponds to 0.7-1.1 ppm. Table 1 shows the breakdown of this DOC into a variety of chemical classes. Table 1. Components of dissolved organic material. Only about 4-11% of the DOC in seawater has been quantified as discrete, identifiable molecules. Much of the nature of the remaining DOC remains unknown. Organics also are often measured in terms of their nitrogen content, such as dissolved organic nitrogen (DON) and particulate organic nitrogen (PON). The same is true for phosphorus, using the terms dissolved organic phosphorus (DOP) and particulate organic phosphorus (POP). Table 2 shows the relative concentrations of C, N, and P in dissolved organic material. In dissolved organic material, nitrogen is about ten-fold less prevalent than carbon, and phosphorus is several hundred-fold lower in concentration than carbon. Table 2. Elemental composition of dissolved organic material. Particulate organic material (POM) is more complicated to quantify than DOM, because by definition POM includes all organic materials larger than 1 mm. That definition includes everything from bacteria to whales. Identifying it as discrete chemicals is also a fruitless exercise. Nevertheless, suspended POC is frequently less plentiful than DOC, often by an order of magnitude (unless, of course, a whale passes through the sampling zone!). Regardless of these complications, particulate organic material can have important implications for a reef aquarium. Its export by skimming or mechanical filtration, for example, can greatly reduce the amount of nitrogen and phosphorus eventually released to the water column, supplying nutrients for algae. It also comprises an important trophic resource for filter-feeding and sediment deposit-feeding organisms. I have not, however, seen any measurements of POM in reef aquaria. In addition to the DOM that arises from natural sources in reef aquaria, we must also keep in mind that many medications, vitamins, food supplements and additives, the acetic acid in vinegar, methanol, the ethanol in vodka, and a host of other things that aquarists are inclined to add are included in DOM. It is obviously beyond the scope of this article to discuss the effects of all of these materials, although some I will mention in passing and will discuss them in greater detail in future articles. Nevertheless, one point that aquarists must keep in mind concerning these organic additives is that the methods used to export naturally occurring organics (carbon, skimming, etc.) may also export the organics in the additives faster than might be preferred. Dissolved organic matter can exert a host of positive, or potentially positive, effects in a reef aquarium. Some of these are outlined in the following sections. Some are obvious, but others are more subtle. Most obviously, DOM can provide energy and nutrients (C, N, P, iron, etc) to many organisms, from bacteria to corals. Additionally, since bacteria can thrive on DOM, and themselves act as a food source for many organisms, the DOM is part of the base of a food chain that rises to the top with the predators in reef aquaria. Another example is aspartic acid (a natural amino acid). It is readily taken up by certain corals, which rapidly incorporate it into proteins that may play an important role in calcification.12 The relationship between certain amino acids and calcification in corals was briefly mentioned in a previous article on the mechanism of calcification and will be discussed in detail in a future article. A brief explanation of how and why aspartic acid and certain other amino acids and organic materials may be involved in calcification is included below. Organic molecules are known to play a substantial role in the formation of calcium carbonate in many organisms, including abalone shells13 and other mollusk shells.14 These materials can be proteins, glycoproteins, mucopolysaccharides, and phospholipids (and likely others that have not yet been identified). They help to induce the nucleation and growth of aragonite and are often referred to as the "organic matrix" because much of the corals' skeleton is composed of these organic materials. They may help control the concentration of free calcium in the coral, and thereby help control the rate of precipitation of calcium carbonate. They may control the location of crystal growth by binding free calcium and ferrying it to the location where the coral wants precipitation to take place. They may bind to the aragonite crystal face and thereby control the rate of precipitation. They may bind to the aragonite crystal face and thereby prevent precipitation in places where the coral does not want the skeleton to grow. They may bind to the aragonite crystal face and thereby inhibit binding of magnesium, phosphate, or other ions that are known to inhibit the growth of calcium carbonate crystals. Regardless of the mechanisms involved, the need for these organics in calcification is easily verified. Allemand, et al15 have studied the role of such materials in Stylophora pistillata. Interestingly, they find that inhibitors of protein synthesis reduce the rate of calcification considerably. For example, reducing protein synthesis by 60-85% reduced calcification by 50%. Inhibiting glycoprotein synthesis yielded a similar result. These results did not arise from reduced metabolism, but rather were the effects of specifically reducing only protein and glycoprotein synthesis. The most important conclusion in their paper may be that the rate of skeletogenesis may be limited more by the rate of biosynthesis and exocytosis of organic matrix proteins than by calcium deposition. Interestingly, the apparently large need for a particular amino acid (aspartic acid) to synthesize these proteins is satisfied by external sources, rather than by either the coral itself or its zooxanthellae. For this reason, some aquarists add aspartic acid, or commercial preparations containing it, to their aquaria. Whether there is a clear benefit to that addition remains to be established. Dissolved organic material may bind to and modulate the solubility, bioavailability, and toxicity of many metals, such as iron and copper. Whether this is good or bad depends entirely on the metal, its concentration, the particular organism involved, and the nature and concentration of the organic matter. Metals take a variety of different forms in seawater, and these different forms have very different properties. Copper, for example, exists in a multitude of forms.16 In natural seawater it has recently become clear that copper is almost completely bound by organic materials.17 Many of these organics are called chelators. A chelating agent is one that can grab onto the copper from two or more directions at once. Since trace metals are present in seawater at far below 1 ppm, there may be plenty of organic material to bind most or all of these metals in aquaria. Within these organic materials will be sites where several carboxylic acid, phenolate, thiolate, amino, or other metal-binding groups come together. These sites are where a metal ion will be most strongly bound. Structurally, it is hard to show a "typical" humic acid binding to copper, but the structure in Figure 1 shows one possibility. a naturally occurring humic acid (shown in green). In this figure, the central positively-charged copper ion (Cu++) is chelated by the larger humic acid shown in green. It is bound ionically by two negatively charged carboxylic acid groups and complexed by one neutral amino group. Together these three groups may hold the copper ion many orders of magnitude more strongly than could any individual binding group. "The collective findings establish that a significant component of bioactive, or nutrient, metals (Mn, Fe, Co, Ni, Cu, Zn, Cd) occur in the colloidal phase along with numerous other trace metals." What does this mean for aquarists? Simply that we do not know much of anything about whether the trace elements in our aquaria are adequately or excessively bioavailable, regardless of concentration. In fact, reef aquaria might even have situations where there is enough of some metal (say, copper) to kill one organism that can readily absorb the organics that it is bound to, and actually have copper depletion in another organism that is unable to take advantage of that form. Dissolved oganic material may bind to the surface of calcium carbonate in reef aquaria, slowing the precipitation of calcium carbonate, helping to raise the levels of calcium, alkalinity, and pH with less precipitation of calcium carbonate onto objects such as heaters and pumps, than would otherwise take place. Magnesium and phosphate also play this role in seawater. Whenever calcium carbonate begins to precipitate, these ions, and possibly organics as well, bind onto the growing surface of the calcium carbonate crystal. In effect they clog up the surface so that it no longer looks like calcium carbonate, making it unable to attract more calcium and carbonate, and precipitation stops. If not for these ions, the abiotic (nonbiological) precipitation of calcium carbonate would likely increase to the point where aquarists could no longer maintain natural levels of calcium and alkalinity. The importance of organic matter for this effect in a reef aquarium is unclear. As long as the process happens exclusively for abiotic precipitation of calcium carbonate, and not where corals deposit their skeletons, it is likely a positive effect. When it inhibits calcification by corals or coralline algae, however, such an effect is likely to be viewed as detrimental. 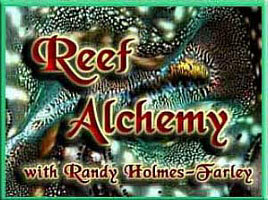 Nearly any smell that is encountered in the context of a reef aquarium is an organic molecule. The one big exception to that being hydrogen sulfide (a rotten egg odor that is sometimes generated in anaerobic environments). These odors include the "ocean" smell that many people find pleasing, as well as the foul odors from dead corals and clams, or that some find in skimmate (mine always smells fine). The same effect of providing energy and nutrients to organisms that may be considered a benefit when the organism is something that aquarists prefer to thrive, might well be considered a detriment when the organisms in question are cyanobacteria or microalgae. Aquarist preferences aside, however, organic materials can provide such "benefits" to organisms whether they are preferred or not. These inorganic nutrients can then drive the growth of undesirable aquarium algae aquaria, and can cause other problems (such as phosphate inhibiting calcification by corals). Consequently, DOM (and also POM) can act both directly as a nutrient source, and also as a source of inorganic nutrients. Some aquaria have large growths of cyanobacteria or microalgae, and in these cases exporting some of the DOM and POM from the water column may be beneficial in reducing the problem. The addition of vinegar to limewater has been correlated with the growth of what appear to be bacterial mats in some aquaria. Presumably, the bacteria thrive on the acetate provided by the vinegar. Another drawback to organics that are taken up by bacteria and other organisms is that in order to metabolize them, such organisms use oxygen (if they are aerobic organisms). Equation 1 (above) shows the net effect of what happens when organics are metabolized. For each carbon atom in a typical organic molecule in seawater, 1.3 oxygen molecules are consumed. At levels of DOM in natural seawater, on the order of 1 ppm, this result implies that oxygen would drop by 3.5 ppm if it were all fully oxidized. Obviously, not all of the carbon will be rapidly and completely oxidized, but if organic levels are appreciably higher in some aquaria than in the ocean, then the oxygen depletion potential may be very important relative to normal saturation levels on the order of 7 ppm oxygen. The consequence of this oxygen consumption is that oxygen levels may be lower in aquaria with high organic levels, especially at night when photosynthesis is not producing excess oxygen. Moreover, during a power failure when both aeration and photosynthesis are greatly reduced, the metabolism of organics proceeds merrily along, reducing the oxygen content of the water faster than it would in the absence of DOM. Many aquarists attribute low ORP readings to elevated DOM (and POM) levels in aquaria. That is likely true in many cases. However, the drawbacks of lower ORP that many aquarists fear may well be caused directly by the organics themselves, rather than by the ORP. So it may, in effect, be double counting to claim that high DOM is undesirable purely because it causes lower ORP. In a previous article I argued that ORP itself, especially when being perturbed with an oxidizer such as ozone, is not a good indicator of water quality generally, or organics in the water specifically. Nevertheless, there is a strong connection between organics in the water and ORP that aquarists should be aware of. Exactly how they are related in reef aquaria is complicated and not all aspects are well known, but what is known is described in the article linked above in both easy to understand and also in more rigorously scientific discussions. Figure 2. Domoic acid, a toxin produced by diatoms. Figure 3. Ciguatoxin, a toxin produced by dinoflagellates. Caulerpin (Figure 4) and caulerpicin are sometimes referred to as toxins, although they appear to be primarily growth regulators present in various species of macroalgae, especially Caulerpa. They are not particularly toxic to animals or bacteria in most studies.4-10 Many aquarists decline to keep Caulerpa sp. in their aquaria, sometimes citing the possibility of elevated levels of such toxins as a reason. Whether these particular "toxins" are of primary concern or not, looking at the structures of these sorts of toxins can help suggest ways to remove them (carbon, for example, since they are very hydrophobic), but I have never seen measurements of the levels of any toxins in aquaria, or comparisons of how well different export mechanisms might reduce those levels. I would consider such measurements to be of significant value to aquarists. Figure 4. Caulerpin, a compound produced by macroalgae, including Caulerpa species. One concern with DOM is that it can absorb light. That absorption serves to decrease the intensity of light reaching photosynthetic organisms, and can also yellow the aquarium's water. The use of activated carbon to remove the yellow coloration in aquaria by binding organic materials has been addressed in a previous article. Other organic export and degradation methods can also serve to reduce light absorption and coloration, including skimming, ozone and other oxidizers, and the use of organic resins such as the Poly-filter. Many of the effects of DOM also extend to particulate organic matter (POM). This may happen both directly, or by POM producing DOM as it is broken down in the aquarium or incorporating DOM within the particulate matrix. Some effects, however, are different. Particulate organic material, for example, does not have the same sorts of highly toxic organic molecules in it that DOM can have (e.g., ciguatoxin). It also is used as a food source by a different subset of reef aquarium inhabitants than is DOM. It is, however, a very important contributor to many processes involving organic matter in reef aquaria. There are a variety of ways to export organics from reef aquaria. These include the use of activated carbon, skimming, polymer resins, and mechanical filtration, and may also include the carbon and sulfur denitrators. These export methods may all have different efficacies for different constituents of the total organic matter. Consequently, combinations of different methods may be more useful than a single method alone. This export of organic matter is, however, too lengthy a subject to go into detail about here, and will be covered in more detail in future articles. In my opinion, organic materials are one of the biggest chemical mysteries in reef aquarium husbandry. This lack of understanding stems from two primary issues: huge numbers of different organic chemicals are present in aquaria, and they are all difficult to quantify (relative to testing for inorganic ions, for example). This lack of understanding may be leading aquarists to fear things that are not a problem, and to miss things that are. Hopefully, reef aquarists of the future will have a better handle on what is happening with organics in their aquaria. I talked to a number of professional chemists at the recent MACNA conference in Boston, and several indicated a willingness and capability to begin addressing these issues. To get such folks started, we need to figure out what the most pressing issues are that are solvable with currently available technologies. Once that has been determined, it is largely a matter of time and money before useful results might be obtained. In the meantime, Happy Reefing! 1. Variable aging and storage of dissolved organic components in the open ocean. Loh, Ai Ning; Bauer, James E.; Druffel, Ellen R. M. School of Marine Science, College of William and Mary, Gloucester Point, VA, USA. Nature (London, United Kingdom) (2004), 430(7002), 877-881. 2. Corian® Solid Surface is distributed and sold by DuPont worldwide. 3. Acetate cycling in the water column and surface sediment of Long Island Sound following a bloom. Wu, Hanguo; Green, Mark; Scranton, Mary I. Marine Sciences Research Center, State University of New York, Stony Brook, NY, USA. Limnology and Oceanography (1997), 42(4), 705-713. 4. Toxins associated with medicinal and edible seaweeds. Higa, Tatsuo; Kuniyoshi, Masayuki. Department of Chemistry, Biology, and Marine Science, University of the Ryukyus, Okinawa, Japan. Journal of Toxicology, Toxin Reviews (2000), 19(2), 119-137. 5. Caulerpin, caulerpicin, Caulerpa scalpelliformis: comparative acute toxicity study. Vidal, J. P.; Laurent, D.; Kabore, S. A.; Rechencq, E.; Boucard, M.; Girard, J. P.; Escale, R.; Rossi, J. C. Fac. Pharm., Univ. Montpellier I, Montpellier, Fr. Botanica Marina (1984), 27(12), 533-7. 6. Distribution of caulerpin and caulerpicin in eight species of the green alga Caulerpa (Caulerpales). Vest, S. E.; Dawes, C. J.; Romeo, J. T. Dep. Biol., Univ. South Florida, Tampa, FL, USA. Botanica Marina (1983), 26(7), 313-16. 7. Antibacterial activity of major secondary metabolites found in four species of edible green macroalgae genus Caulerpa. Vairappan, Charles Santhanaraju. Borneo Marine Research Institute, University of Malaysia Sabah, Sabah, Malay. Asian Journal of Microbiology, Biotechnology & Environmental Sciences (2004), 6(2), 197-201. 8. Research progress on Caulerpin: plant growth regulator from algae. Huang, Libo; Cen, Yingzhou; Xu, Shihai; Li, Yaolan; Xu, Shaoyu; Wu, Qiuming. Department of Chemistry, Jinan University, Canton, Peop. Rep. China. Tianran Chanwu Yanjiu Yu Kaifa (2001), 13(2), 74-78. 9. Inhibitory effects of extracts from the marine alga Caulerpa taxifolia and of toxin from Caulerpa racemosa on multixenobiotic resistance in the murine sponge Geodia cydonium. Schroder, Heinz C.; Badria, Farid A.; Ayyad, Seif N.; Batel, Renato; Weins, Matthias; Hassenein, Hamdy M. A.; Kurelec, Branko; Muller, Werner E. G. Institut fur Physiologische Chemie, Abteilung Angewandte Molekularbiologie, Universitat, Mainz, Germany. Environmental Toxicology and Pharmacology (1998), 5(2), 119-126. 10. Intraplant variation in secondary metabolite concentration in three species of Caulerpa (Chlorophyta: Caulerpales) and its effects on herbivorous fishes. Meyer, Karen D.; Paul, Valerie J. Mar. Lab., Univ. Guam, Mangilao, Guam. Marine Ecology: Progress Series (1992), 82(3), 249-57. 11. Uptake and accumulation of dissolved, radiolabeled nodularin in Baltic Sea zooplankton. Karjalainen, M.; Reinikainen, M.; Lindvall, F.; Spoof, L.; Meriluoto, J. A. O. Finnish Institute of Marine Research, Helsinki, Finland. Environmental Toxicology (2003), 18(1), 52-60. 12. Organic matrix synthesis in the scleractinian coral Stylophora pistillata: role in biomineralization and potential target of the organotin tributyltin. Allemand, Denis; Tambutte, Eric; Girard, Jean-Pierre; Jaubert, Jean. Observatoire Oceanologique Europeen, Centre Scientifique de Monaco, Monaco. Journal of Experimental Biology (1998), 201(13), 2001-2009. 13. Direct Observation of the Transition from Calcite to Aragonite Growth as Induced by Abalone Shell Proteins. Thompson, J. B., Paloczi, G. T., Kindt, J. H., Michenfelder, M., Smith, B. L., Stucky, G., Morse, D. E., Hansma, P. K. (2000). Biophys J 79: 3307-3312. 14. Control of aragonite or calcite polymorphism by mollusk shell macromolecules. Falini, G., Albeck, S. Weiner, S. and Addadi, L. (1996) Science 271, 67-72. 15. Organic matrix synthesis in the scleractinian coral Stylophora pistillata: role in biomineralization and potential target of the organotin tributyltin. Allemand, Denis; Tambutte, Eric; Girard, Jean-Pierre; Jaubert, Jean. J. Exp. Biol. (1998), 201(13), 2001-2009. 16. Chemical Oceanography, Second Edition. Millero, Frank J.; Editor. (1996), 496 pp. 17. Intercomparison of voltammetric techniques to determine the chemical speciation of dissolved copper in a coastal seawater sample. Bruland, Kenneth W.; Rue, Eden L.; Donat, John R.; Skrabal, Stephen A.; Moffett, James W. Institute of Marine Sciences, University of California at Santa Cruz, Santa Cruz, CA, USA. Analytica Chimica Acta (2000), 405(1-2), 99-113. 18. Chemical speciation of copper and zinc in surface waters of the western Black Sea. Muller, Francois L. L.; Gulin, Sergei B.; Kalvoy, Ashild. Department of Chemistry, University of Bergen, Bergen, Norway. Marine Chemistry (2001), 76(4), 233-251. 20. Chemistry, etiology and determination methods of ciguatera toxins. Yasumoto, Takeshi; Satake, Masayuki. Faculty of Agriculture, Tohoku University, Sendai, Japan. Journal of Toxicology, Toxin Reviews (1996), 15(2), 91-107.